WASHINGTON (CNS) — Just because the new CBS sitcom “Living Biblically” has landed a spot in the network’s decades-dominant Monday night comedy lineup does not automatically guarantee it an audience. “I knew this show would get a lot of attention from religious viewers,” Walsh told Catholic News Service during a Feb. 8 telephone interview from Hollywood. “I knew that going in, just from internet comments, religious people get nervous and they get scared about religious comedy. They fear they would be mocked. I figured, why give them a reason to turn it off?” he said. “We hope that the language would be clean enough for families to be able to discuss” the show after watching it together, Walsh added. “Living Biblically” is adapted from the A.J. Jacobs book of the same title, in which he kept a yearlong diary of trying to live his life entirely according to biblical precepts. It will air at 9:30 EST Mondays on CBS starting Feb. 26. In the adaptation, Chip (Jay R. Ferguson) is at a crossroads after his best friend dies and his wife (Leslie Kraft) announces she’s pregnant. He gets it into his head that, by living according to what the Bible says, he’ll be a better man, husband and father. The series also stars Camryn Mannheim (“The Practice”) as his boss and Tony Rock (Chris’ brother) as his buddy at work, while Sara Gilbert is featured in half of the 12 shows made thus far — possibly because her “Roseanne” co-star Johnny Galecki (“The Big Bang Theory”) bought the rights to the book and is another executive producer of the show. Other cast regulars include Ian Gomez (“Cougar Town”) as Father Gene, and David Krumholtz (“Numb3rs”) as Rabbi Gil, friends who get hooked into serving as Chip’s spiritual advisers on his quest. 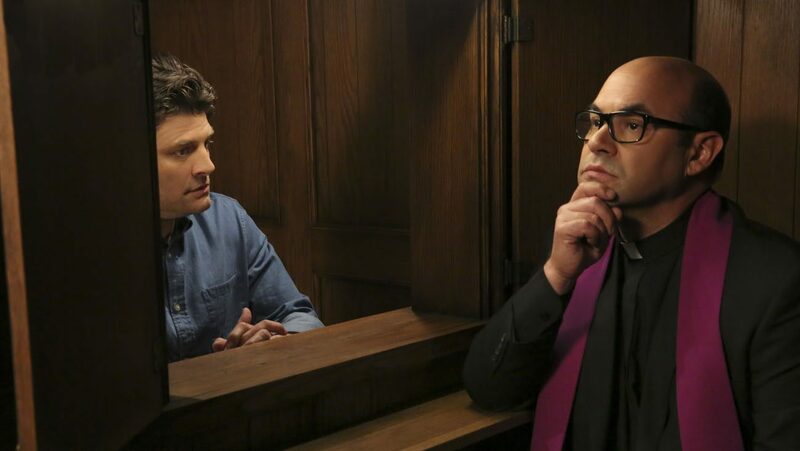 “Living Biblically” had both a priest, Jesuit Father Gregory Goethals, and a rabbi, Joshua Hoffman, review each script. And yes, the “priest and a rabbi in a bar” joke is part of the pilot episode. Walsh’s father is a theology professor at a community college in Missouri, where he gets to develop his own course offerings. Walsh said his courses have ranged from the history of the Catholic Church to religious extremism. His model of comedy — not that Walsh puts “Living Biblically” it its class — is “All in the Family,” because it “showed you every point of view every week, and you got laughs on both sides. That was a touchstone for me and for Johnny — one that was talked about a lot If we were going to get this opportunity to talk about religion in prime time. Whether there’s a second season depends on viewership and CBS. But Walsh told CNS the Bible serves as a near-endless repository of precepts that can be used for future episodes. He added, “For the first season we did the basic ones, the Ten Commandments, very simple: Thou shalt not lie; it’s a lot harder not to lie than you think,” he said.